Saundersfoot was known in medieval Wales as Llanussyllt and after the Norman conquest as St Issels (sometimes Issells), both after the parish church dedicated to the Welsh saint Issel. Its bishop or abbot was considered one of the seven principal clerics of Dyfed under medieval Welsh law. It was a substantial parish in 1833 with 1,226 inhabitants. John Marius Wilson described the village and parish as St Issells in his 1870–72 Imperial Gazetteer of England and Wales. The church lies in a dell to the north of Saundersfoot and is a grade II* listed building. Permission to build the harbour was granted by Parliament in 1829 to the Saundersfoot Railway and Harbour Company for the export of anthracite coal from the many mines in the area, although coal was exported from the beach for centuries before this. The village grew up to serve the port which by 1837 had five jetties handling coal and iron ore and subsequently pig iron and firebricks from local sources. The course of the tramway from Bonville's Court mine bisects the village and ends at the jetty. The tramway from Stepaside forms the sea front. The industry finally faded away in the early years of the twentieth century. Saundersfoot railway station is a mile from the village centre just off of the B4316 road. Trains call here every two hours in each direction, westwards to Pembroke Dock and eastwards to Whitland, Carmarthen and Swansea. The electoral ward of Saundersfoot is coterminous with the boundaries of the Saundersfoot community. It elects one county councillor to Pembrokeshire County Council. Saundersfoot has a playing field named King George's Field. Saundersfoot Karate Club meet every Wednesday. All ages and abilities are welcome. The pubs in the centre of Saundersfoot include 'The Captains Table', 'The Royal Oak', 'The Mulberry', 'The Hean', 'Mermaid On The Strand' and 'The Deck'. Local attractions include Folly Farm, Heatherton World of Activities, Manor House Wildlife Park and Tenby Dinosaur Park. Saundersfoot holds its annual charitable cheese festival and New Years Day swim every year which is sponsored by local businesses. More than 1,500 people took part in 2016. ^ "Ward and community population 2011". Retrieved 21 April 2011. ^ Wade-Evans, Arthur. Medieval Welsh Law, p. 263. ^ "GENUKI: St Issells". Retrieved 8 February 2016. 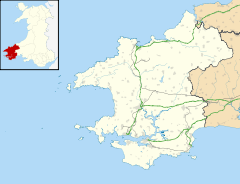 ^ "History of St Issells in Pembrokeshire: Map and description". Retrieved 8 February 2016. ^ "St.Issell's Church, Saundersfoot". British Listed Buildings. Retrieved 29 December 2013. ^ "1,500 take part in New Year's Day Saundersfoot swim". BBC. 1 January 2016. Retrieved 8 February 2016. Wikimedia Commons has media related to Saundersfoot.